March 14, 2018 — Links International Journal of Socialist Renewal reposted from Waging Nonviolence — Three decades after the People Power revolution ended the bloody regime of Ferdinand Marcos in 1986, Asia’s oldest republic is at a crossroads. Since Rodrigo Duterte became president of the Philippines in June 2016, he has led an extrajudicial killing campaign that has taken over 12,000 lives. Officially cloaked as an anti-crime policy, his “war against drugs” has nevertheless failed to address the genuine roots of the country’s narcotics crisis. It has instead only worsened the situation by victimizing the urban poor at a staggering rate. In recent months, there has also been a particularly bloody escalation of hostility against the progressive movement under his regime. Over a dozen activists from left-wing groups were executed in December, among them religious leaders and indigenous farmers from the south of the country in Mindanao. The island has been under martial law for nine months, due to the war between government forces and jihadist militants in the city of Marawi, which ended in October. Duterte’s congressional and judicial allies did not hesitate to extend military rule in the region despite the actual absence of rebellion. Moreover, Duterte’s order to declare the Communist Party of the Philippines, or CPP, and its armed wing, the New People’s Army, terrorist organizations has created more incentives for the military to accelerate its aggressions against the militant left. This has provided a pretext to oppress the CPP’s affiliates on the legal front, a development that has already occurred in recent weeks, when the president publicly vowed to extend his crackdown against these organizations. More recently, after the International Criminal Court’s chief prosecutor announced she was opening a preliminary investigation for crimes against humanity surrounding the “drug war” killings, Duterte did not tone down his brutal rhetoric. He explicitly called for summary executions of rebel fighters and incited sexual violence against female rebels, acts that are tantamount to war crimes. Yet the government’s increasingly authoritarian tactics are a symptom of its lack of popular support. By targeting the country’s “undesirables” first, he may have provided a useful pretext for today’s broader repression, but the campaign’s brutality has also helped crystallize opposition to his government. This opposition was on full display during the last week of February, with the nationwide commemoration of the People Power revolt that was celebrated through protests against Duterte’s tyrannical policies. The youth-led demonstrations were one notable event that demonstrated a growing trend of radicalization among the young generation. Considering Duterte’s crackdown is now encompassing dissenting voices from schools and universities, this is a welcome development since it is more important than ever to empower and organize the youth. The force of this maturing resistance began to blossom last fall when Filipinos all over the country took to the streets to mark the 45th anniversary of Marcos’ declaration of martial law. The “National Day of Protest” on Sept. 21 didn’t just memorialize the suffering that occurred under the Marcos dictatorship. It provided an opportunity for the opposition to flex its popular support against the government. Those who came to speak out against the regime vastly outnumbered Duterte’s supporters. These oppositional forces represented a broad and popular force in the making. It further proved that even though Duterte has the tools of a repressive state at his disposal, he cannot count on a mass base to come to his defense. One of the major formations that surfaced was the Movement Against Tyranny, led by the traditional militant left, the National Democrats, under the Maoist umbrella of the CPP. The CPP allied with Duterte at the beginning of his term, but this coalition became strained as the president neglected to support their comrades in cabinet appointment hearings. Renewed popular outrage gave them a chance to distance themselves from Duterte through the late-August launch of the Movement Against Tyranny. However, they only “officially” severed parliamentary ties weeks later after an ally at the Department of Agrarian Reform was rejected. Such a broad coalition might not have even come into being had their cabinet appointments been approved. Indeed one of the greatest sins ever committed by the militant left was giving Duterte the benefit of the doubt, despite the signs that his government’s policies — backed by demagogic rhetoric and authoritarian methods — would only prolong a neoliberal economy and marginalize the masses even further. Duterte’s candidacy served as a litmus test for the National Democrats’ commitment to progressive principles — one that they failed. Another major political force is Tindig Pilipinas, or “Rise Up Philippines,” launched a few days before the National Day of Protest. It’s a broad coalition that includes minority blocs from congress; figures from the previous Liberal Party establishment; the social democratic party Akbayan, which coalesced with the liberals in the previous administration of Benigno Aquino; and the nationalist, anti-communist Magdalo group, composed of former junior officers of the armed forces led by Antonio Trillanes, Duterte’s most vocal critic in the senate and a former military man who staged a few failed coups against the presidency of Gloria Macapagal-Arroyo during the 2000s. When it comes to the influence of leftist parties in Philippine parliamentary politics, Akbayan has the second largest base of support after the National Democrats. 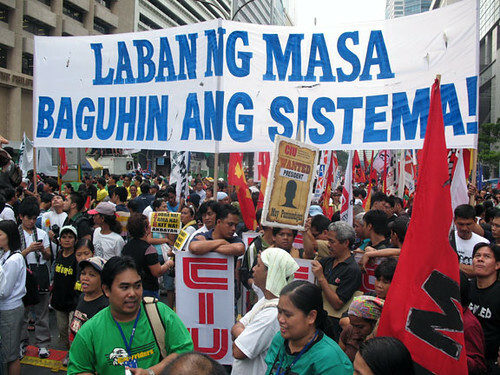 Akbayan’s rise was made possible by groups that broke away from the traditional militant left in the 1990s, a decade defined by left-wing setbacks, as the largest mass formation of the militant left fragmented into multiple blocs. Since then, the party has had some success in getting people elected in both houses of congress and eventually became one of the leading voices behind progressive legislation. However, its social democratic values were called into question when it failed to take a more critical stance against the Aquino administration in its later years when issues of accountability came up, which ultimately led to the rise of Duterte. Akbayan eventually became the liberals’ grassroots wing during the 2016 elections, when it decided to back the Liberal Party frontrunner and Aquino’s designated successor. Fortunately for the country’s vibrant democracy, the Philippines’ diverse progressive movement includes various independent organizations. As with the social democrats, most of them were derived from breakaway organizations that resulted from the 1990s split. But unlike Akbayan, their success in recent elections have been almost non-existent, effectively sidelining them from the national political scene. But this may change with the new creation of Laban ng Masa, or “Struggle of the Masses,” the third oppositional force encompassing a coalition of socialist-oriented groups who have been consistent in their opposition to Duterte’s presidency from the beginning. The coalition’s leader is activist-academic Walden Bello, who in 2016 ran an unsuccessful independent senate campaign supported by many of the same groups that now make up Laban ng Masa. By running outside the sponsorship of the National Democrats and Akbayan, Bello sought to build a campaign without corporate backing or relying on patronage politics. Laban ng Masa is the only bloc among the three that is openly positioning itself as a left-wing alternative. In his speech, at its first general assembly, Bello emphasized the movement’s socialist vision of realizing a system of radical democracy and equality — a future beyond capitalism that’s worth fighting for. There is no doubt that this alliance retains the moral high ground among the three. Yet it lacks the political capital and resources of the left-liberal factions making up Tindig Pilipinas and the mass base of the Movement Against Tyranny, whose backing by the militant left makes it part of the country’s largest organized left-wing coalition. From this position, the National Democrats are confident in their ability to control the narrative. After all, the CPP has been waging an armed struggle against the Philippine state for almost half a century, which makes it Asia’s longest running communist insurgency. Despite their dogmatic ideology stuck in Cold War-era rhetoric, they continue to mobilize mass support thanks to their grassroots fronts and sub-organizations, which refrain from actively promoting the armed struggle and primarily utilize nonviolent tactics. A tactical alliance between these oppositional blocs would lead to a New Left in the Philippines. Its likelihood and character rests on the choices each force makes in the coming months. Long-term issues that touch on ideological boundaries need to be discussed intensively, especially on the part of the National Democrats. But surely, given their willingness to ally with an authoritarian strongman like Duterte, they should be inclined to show the same favor towards other groups. If they don’t, they will be unable to radically shape a new political order. The lack of solidarity among left-wing groups has plagued the country for decades. A fresh reformist project must reaffirm the importance of progressive pluralism. For this project to be successful, the National Democrats need to take ownership for their past transgressions, in particular their continuing refusal to genuinely acknowledge their complicity and insist that their alliance with Duterte was a critical engagement in “principled unity and struggle,” a courtesy that was never extended to any previous president. Opposition forces must also wrestle with whether to call for Duterte’s ouster. Simply ousting the president will not address the structural problems that led to his rise. Even progressive activists who support ousting him, like Laban ng Masa’s Herbert Docena, recognize that only through a broad and unified mass movement can an actual alternative emerge. Plus, considering Duterte’s durable popularity among many Filipinos, particularly from the middle and upper middle classes, such an action would deepen the divide among the populace and pave a fresh path towards another strongman citing the “golden age” of Marcos. As for Tindig Pilipinas, the group’s social democratic forces have yet to account for its association with the previous government and have so far shown no concrete plan for how to fix the country without going back to the failed elite-dominated democracy that led to Duterte’s surge. So far, they have also hesitated on calling for the president’s ouster, and instead focused on vague goals like appealing to the government to take a “healing approach” to the drug war, which assumes that the country’s institutions are capable of change without reforming them from the ground up. Indeed, using the law to resist authoritarian abuse of power is essential, and resisting Duterte’s dictatorial tendencies through the courts is something that needs to be taken advantage of. But the struggle through administrative entities or legal battles can only triumph if they are reinforced by collective action. And that is more needed than ever, since Duterte is slowly stepping up his game in railroading constitutional bodies as part of his blueprint of reforming the country’s political system. After toppling the Marcos dictatorship, Filipinos have witnessed the gradual return of the Marcos family into politics. Ferdinand “Bongbong” Marcos Jr.’s 2010 senate victory was bad enough. Worse still was his near success in capturing the vice presidency in 2016. Bongbong’s bid for vice president was barely defeated by the liberal frontrunner. Yet he still succeeded in tarnishing the legacy of People Power. Duterte, despite having a different running mate, continuously acted as an apologist and sponsor to the family while on the campaign trail. The support was of course mutual. As a token of gratitude, in November 2016, Duterte green-lighted a highly controversial hero’s burial for the former tyrant, an issue that has divided the nation since the revolution and a subject that the Marcos dynasty has pushed for since their return to the country. By putting the despot on a pedestal, Duterte catalyzed the first major protest wave against his presidency, less than five months after taking office. The anti-Marcos protests gathered various civil society organizations, such as the #BlockMarcos movement, to form an alliance not only against the Marcos burial but also as a stepping stone towards a more organized opposition against the presidency, which culminated last fall. It’s not the first time that Duterte has tried to launch a kind of “people’s movement” akin to that of the National Democrats. In 2016, his cabinet secretary Jun Evasco, a former member of the CPP, formed but failed to develop the Kilusang Pagbabago, or “Movement for Change,” which aimed to build an insurgent group similar to Marcos’ New Society Movement, a right-wing vehicle for “liberating” the Filipino people that conveniently required the declaration of martial law. In reality, Duterte’s “revolutionary” program consists of constitutional reform meant to consolidate the administration’s power, restrain key political institutions and legalized intimidation of dissident groups. His call for a federalist system of government has been seen as a mere maneuver to extend his term as president. This program has not inspired widespread support. When government allies called for mass demonstrations last November, they expected to rival the September protests in size and force. Instead, they flopped, particularly in Manila where they peaked at a few thousand, far below their expectations of a few hundred thousand people. The mobilization showed that the government has failed to develop a critical mass to counter the rising opposition. Duterte has online trolls at his disposal, but not a grassroots movement capable of mobilizing aggressive demonstrations. The spectacle of the failed “Revolutionary Government” rallies proved that Duterte’s appropriation of anti-establishment rhetoric cannot hold up under the reality of his regime. But that didn’t stop him from taking advantage of his allies in the legislature. The Philippine Congress has now taken the lead and decided to form a constituent assembly to reform the constitution. Indeed, the current situation poses both opportunities and challenges. The next task for such a united front is to maintain the momentum that arose from the September rallies and the subsequent mass actions. Because if the progressive movement in the Philippines is to have a future, it will depend on its willingness to forge more strategic alliances. The shift among the traditional militant left, away from Duterte’s government and towards coalition with a broad opposition, may be a step in the right direction. They must begin to recognize the reality of the plurality of the country’s grassroots movements. Ignoring the struggles of those who have staunchly and consistently fought and resisted Duterte’s brutal regime from the start will not help the cause for a better future. Unless the National Democrats’ sectarian factions acknowledge that there is no future for a doctrinaire left, they will continue to pave their own path towards long-lasting marginalization. They should start realizing the impossibility of winning the armed struggle and that only through a veritable multi-sectoral political struggle can they solidify a true united front towards radical change. As for the social democratic left, a fundamental step is to essentially distance themselves from the reactionary forces that constitute Tindig Pilipinas and rebuild their party by re-embracing the very principles that accompanied its foundation. Moreover, they must overcome the temptations to reinstate the elite democracy that blossomed following the Marcos era and instead join the broader left in advocating for its radical reform. Unfortunately for the socialist forces comprising Laban ng Masa, building a huge mass base with their current resources remains an unlikely prospect, unless they lead the call towards building this unified project while sticking to their radical principles. This will not be an easy task, but if these emergent forces truly desire to deepen democracy in the country, they will need to come together and build a more formidable coalition. Such an undertaking must resist Duterte’s creeping dictatorship, where violence and capital continue to reign supreme, while fighting for true democratic reforms based on social justice and equality. This is the true ongoing struggle of the masses — a struggle for a more genuine progressive alternative that is worth fighting for. March 19, 2018 — Links International Journal of Socialist Renewal reposted from Red Pepper — Since Rodrigo Duterte began his term as the 16th president of the Philippines in 30 June 2016, Filipinos and the international community have watched in horror at accounts of dead bodies found nightly in the country’s streets, linked to extra-judicial killings (EJKs). What is more appalling is that the police force, supposed to protect and serve people, are themselves involved in or directly doing the killings. Those familiar with the Philippine’s recent history, especially the heroic struggle by anti-dictatorship and democracy movements that toppled the brutal authoritarian rule of Ferdinand Marcos in 1986 wonder what is going on in the country. The Real Numbers Update report from the website of the Philippine National Police (PNP) listed a total of 81,919 anti-drug operations, resulting in 119,361 arrests and deaths of 3,987 suspected drug users from 1 July 2016, to 17 January 2018. The Human Rights Watch World Report 2018, said more than 12,000 drug suspects were already killed in the same period. In a speech delivered to the Philippine Senate in 21 February by Senator Antonio Trillanes, he pointed out that there is also 16,355 drug-related homicide cases that are still under investigation from July 1, 2016 to September 30, 2017 in the PNP Real Numbers Update report. He claims that it means the real number of deaths related to the drug war is at least 20,322. Despite the big variation in numbers, one thing is clear – tens of thousands have already already killed by his ‘war on drugs’ policy. The dead were denied justice and killed like animals in their homes or in the street. Among the dead are innocent minors and children who are considered “collateral damage” of the senseless killing. EJKs are not new in the Philippines. Suspected communists and activists were killed, involuntarily disappeared and tortured while in police and military custody under two decades of Marcos’ regime. It also happened under successive post-Marcos governments. What is new, is the way the police’s role in the mass killings and Duterte’s cruel, aggressive and unapologetic stance about his government’s intention to continue killing Filipino citizens is normalised. Much worse, no one has been punished and the impunity by which the law is blatantly disregarded daily is unprecedented. Even if the number of EJKs so far under Duterte is indeed what the PNP claim, a low 3,800, it already equals the number of people reportedly killed in the 14-year record of the Marcos dictatorship. It would be about three times the number of EJKs (1,200) recorded during the nine-year watch of Gloria Macapagal-Arroyo from 2001 to 2010. No one was tried and punished for those crimes. According to a feature article in the website of the Catholic Bishops’ Conference of the Philippines (CBCP), extra-judicial killing seems to be Duterte’s hallmark campaign against criminality if his 19 years of service as mayor of his home city of Davao in southern Philippines is anything to go by. The CBCP article is worth noting for the similarity between Duterte’s methods then as a city mayor and what is happening nationally now that he is the Chief Executive. The article described the operations of the dreaded Davao Death Squad (DDS), a vigilante group that Duterte founded. It allegedly killed 1,424 people from 1998 up to the end of 2015. From this number, the report listed that 132 were children under 17 years old, the youngest was 12 years old. The DDS, is believed to be responsible for summary executions of street children and individuals suspected of petty crimes and drug dealing in Davao. An article from The Guardian also described a hearing held by the Philippine Senate in March 2017, wherein Arturo Lascanas, a retired police officer and former leader of Duterte’s first DDS hit squad claimed under oath that the president personally gave them orders to kill in 1989 when he was still mayor. The article further quoted Lascanas’ admission that he personally killed about 200 people. Lascanas also alleged that Duterte’s son and current Davao vice mayor, Paulo Duterte, had links to the drug trade. However, the Philippine Senate closed the hearing, for “lack of further proof”. When Duterte campaigned for presidency, he promised that if elected his means to stop drug use in the country “will be bloody” and that “there will be no need for more jails – just funeral parlours.” The term “tokhang”, from the Visayan language meaning “to knock and plead” became the most feared word. It is because when a Police Operation Tokhang, goes to one’s neighbourhood, it practically means someone will get summarily executed or hauled to police station on mere suspicion of drug use. In February 21, the Department of Justice filed a motion in the Manila Regional Trial Court Branch 19 seeking to declare the Communist Party of the Philippines (CPP) and its armed wing, the New People’s Army (NPA), terrorist organizations. It also sought to tag a UN special rapporteur, a former lawmaker, four former priests and at least 600 individuals as terrorists. Included in the list of 600 is the UN special rapporteur on the rights of indigenous peoples, Victoria Tauli-Corpuz, and Joan Carling, UN Permanent Forum on Indigenous Issues and currently co-convener of the Indigenous Peoples Major Group on Sustainable Development. The motion to tag activists as terrorists blur the lines of legitimate dissent and terrorism. It is doubly alarming because of the recently passed law granting subpoena powers to the police despite their implications in summary executions. This could lead to more impunity or it could also signal that activists will be the next target of tokhang operations. International human rights organisations already warned that indigenous leaders and environmental defenders are killed in the Philippines in an alarming rate. After the ousting of Ferdinand Marcos, The Philippine Left was divided into various factions. The big question at this juncture in the country’s deeply worrying situation is whether the Left can unite in the fight against Duterte. Joshua Makalintal’s article about the challenges of building unity against Duterte offers a very good glimpse about the very crucial, difficult, and inspiring possibility of building a new Left in the country at this historic juncture. Makalintal identified three groupings. The first is the traditional militant left, the National Democrats, under the Maoist umbrella of the Communist Party of the Philippines that worked with Duterte at the beginning of his term. However, the coalition did not survive as the Duterte did not support prominent leaders from left-wing movements that he initially appointed to cabinet position in appointment hearings. The leaders came from left mass based organisations that work in close partnership with the National Democrats. The groupings recently launched the Movement Against Tyranny. Secondly, there is Tindig Pilipinas or “Rise Up Philippines”, a broad coalition that includes minority parties in the Philippine’s legislative branch and their affiliated organisations. This grouping range from members of the Liberal Party, the social democratic party Akbayan, and the nationalist, anti-communist Magdalo group. The Liberal Party is the most established party in this grouping, while Akbayan has the second largest left organizational base next to the National Democrats. Magdalo is composed of former junior officers of the armed forces led by Antonio Trillanes mentioned earlier here. The “third force”, the newly organized Laban ng Masa, or “Struggle of the Masses,” is a coalition of socialist-oriented groups who have been consistent in their opposition to Duterte’s presidency from the beginning. The coalition’s leader is activist-academic Walden Bello. Bello ran a senate campaign supported by many progressive organisations and NGOs in 2016. He is known in the international anti-globalisation movement. The Philippine Left and the pluralist progressive movement is much smaller now compared to its strength when Marcos was ousted. The work ahead in opposing Duterte will be difficult and there is that challenge of winning back the masses that became disappointed for the lack of structural changes after 1986. Many of them voted for Duterte. Earlier this month, the International Criminal Court based in The Hague opened an inquiry on possible crimes against humanity committed by Duterte since he started his term of office.